Thanks to Zaf for making this forum available. 1. If the hands can be sourced anywhere independent of JLC? I'm inclined to have the watch serviced outside of JLC if this is possible. 2. If JLC has the hands and the likely cost of such? Otherwise, I'm not sure I'd send it back. 3. The likelihood and cost of removing an age spot on the dial? I don't want a redial. 4. The potential cost of a new old stock dial, if that even exist. The hands are most important. Can you post a photo? The hands may be the same as a cal 881/883 dress watch. So maybe you can find that and use those. Thanks for your kind reply. I have attached an image of the Geomatic. I think the hands are not original. The style and length are incorrect. The lume is bright. Yes, not correct. The cal 881/883 hands will fit and I'm pretty sure some no Geo dress watches have the same. I think for around 2500 Euro you'd get the service the hands and a dial. Question is, do they have an original dial? That I can't answer. If you have to go on the cheap, keep watching ebay, an 881 / 883 with hands will show up eventually. So, you do think that JLC does have the hands? And, removing the age spot on the dial is likely not realistic (either keep dial as is or source original dial if available)? I will have see if I can understand how to recognize which JLC's have the 881/883 caliber so I can search for them out there. I believe Master Mariners have them...anything else? Thank you again. Good chance the old "dress style" Master Mariner will have the same hands. Other dress autos maybe as well. I suspect JL will have the hands, and 70% chance on the dial. I'd only send it there if they have the dial though....if you're going to pay that much on their restoration. Thanks for this. It looks like it will be quite an expense either way to get those hands, unless I use a watch I already own. Here is a Master Mariner I own. Is this a K 883? The movement says "Z 883." Would these hands work as donors for the Geomatic? The case on this Master Mariner is about 33mm without the crown. 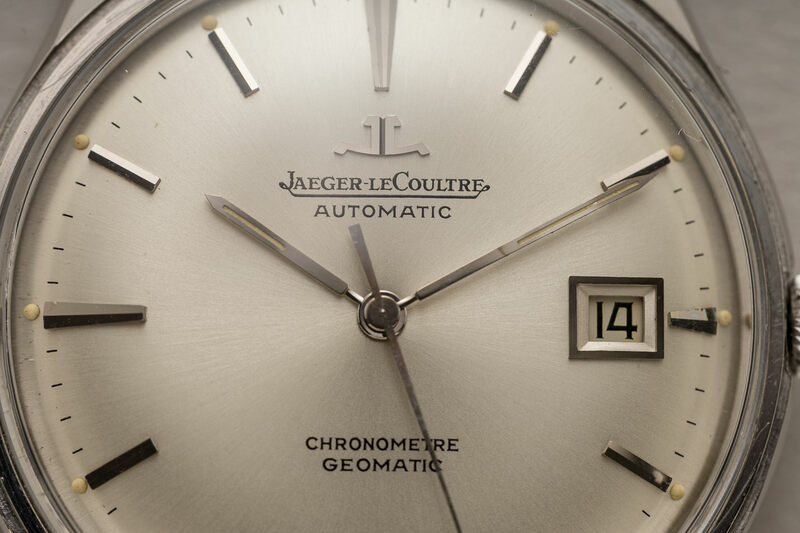 I think the minute hand would be too short to reach the minute track of the Geomatic dial. Any opinions? I'm not sure I'd want to plunder the Master Mariner.